Jim Bregante – Has retired from Public Speaking. Jim Bregante is a native San Diegan, Docent for the Maritime Museum of San Diego, member of the San Diego History Center, and the Italian Historical Society. An experienced speaker, Jim shares his experience of growing up in Little Italy, near the vibrant life of the waterfront, via a PowerPoint presentation, featuring pictures from historical and family archives. Jim’s memories are shared and treasured by many San Diegans. Today, Jim has been called to share his story with many groups throughout San Diego. In twelve years, Jim has given 335 presentations to an audience of over 12,800 people. His program has been well received by many interested groups. 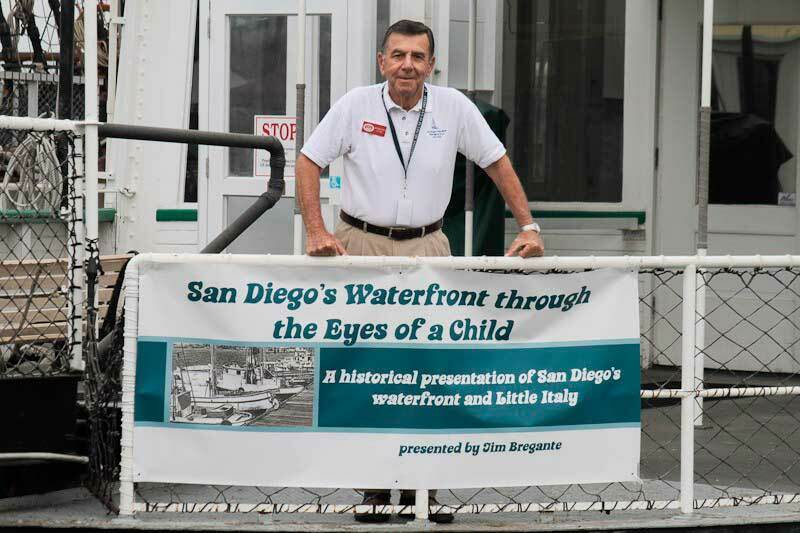 Step back in time with Jim Bregante’s historical presentation of San Diego’s Waterfront and Little Italy. Recently published and available at the Maritime Museum gift shop. Visit Jim Bregante’s “My Historical Presentation” website: Click here.